I had no idea that dads were in uncomfortable positions squatting in the men's bathroom or placing babies on sinks to change diapers. Changing diapers can be challenging. I just never thought it was a problem for dads or assumed that mothers were changing babies diapers half of the time. New York fathers will now have changing tables in men's public restrooms due to the new law implemented this year. This is awesome news and I applaud New York State for stepping up and recognizing that dads change diapers too. The new law that goes into effect in 2019 changes the state's building code to require new and renovated buildings with public bathrooms to provide changing tables in both the women's and men's restroom. There are changing tables in most women's bathrooms, and some men are uncomfortable and embarrassed to change diapers in the ladies restrooms. The design of public restrooms in the past were only made to accommodate women and their babies with no consideration of the manly perspective. 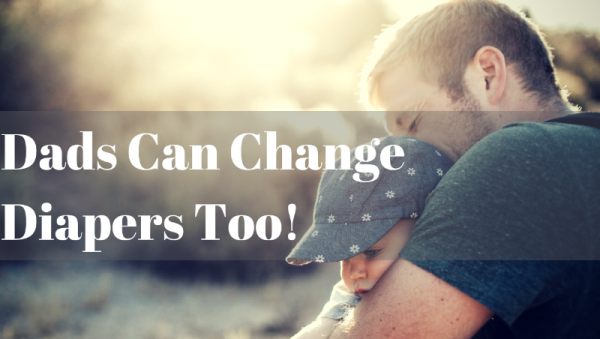 Hopefully, this change will encourage other fathers to take an active role in their children's lives.